Math Tutoring- Just a click away! eAgeTutor.com provides learning driven , diagnostic-based instruction to ensure that all students, no matter their level or needs get the individualized instruction that they require for success. In fact, all students completing a full eAge course are guaranteed to demonstrate a grade-level increase by the end of their 72 hours tutoring program. Online Math Tutoring- How does it work? First, simply register to qualify for one free hour of Math tutoring. Then, select the Math Tutoring eAge excellence program that you would like to sign up for. student performance in more than 70 areas. Based on this diagnostic, eAge academic counselors customize a learning plan to address that particular students needs. The student then joins a dedicated eTutor for hourly one-on-one sessions whenever it is most convenient for the student. eAgeTutor.com guarantees that completion of any 72 hour eAge Excellence Program will result in a grade level improvement in that subject. 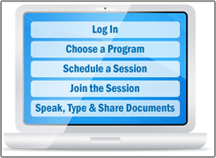 Once you have chosen the program, you schedule a session through your eAge Student Portal. Simply log in at the scheduled time to meet with your online Math tutor. Online Math Tutoring- Why choose eAge? All online Math tutoring sessions are voice-enabled allowing you to talk naturally back and forth with your tutor no chat-only tutoring sessions. Tutoring happens in a fully multimedia classroom you can even scan and upload your assignments for your tutor to see! Math Tutoring sessions is scheduled in advance, so you never have to worry about not having a tutor available. All the Math tutoring sessions are recorded so that you can revise the complex Math concepts at your convenience. We care for our students; our Math tutors work one-on-one with a single student. You can be assured; you have 100% of our Math tutors attention. eAge Math Tutoring ensures students master what they need to learn no quick fixes or simply providing answers. Instead, our tutors are ethical, educational professionals invested in students' long-term success. Are you struggling to help your child/children with getting Math Tutoring help. Is the quadratic equation something you only vaguely remember? For many of us, it has been a long time since we sat behind a desk. In today's challenging academic environment, building strong foundation in complex areas like Algebra, Calculus and Trigonometry, is simply not something every parent can provide. However, there is a convenient and affordable answer to this challenge: eAge Excellence Program. Each program, designed by certified U.S. master instructors and content developers, begins with an initial diagnostic assessment, a $250 value, that determines student's strengths and areas of need. These content standards were designed to encourage the highest achievement of every student, by defining the knowledge, concepts, and skills that students should acquire at each grade level. Based on student performance, an eAge academic counselor works out a completely custom-tailored step-by-step Math tutoring program to address fundamental skills-building that each student requires for academic success. These learning programs are then implemented by a highly qualified Math online tutor (eTutor) who works one-on-one with the student in a live, online multimedia classroom. Students and eTutors move through each course together, beginning with a review of the last class materials, followed by a new lesson, then by guiding practice, and finally ending with a mastery demonstration. Each Math Tutoring course includes routine assessments that are communicated to parents or guardians by an eAge academic counselor to ensure parents or guardians stay informed about their student's progress. Each course ends with a comprehensive exam that demonstrates student's academic growth. All students are welcome to take the next level diagnostic exam to provide a prescription for additional instruction to ensure that they continue to improve their performance.